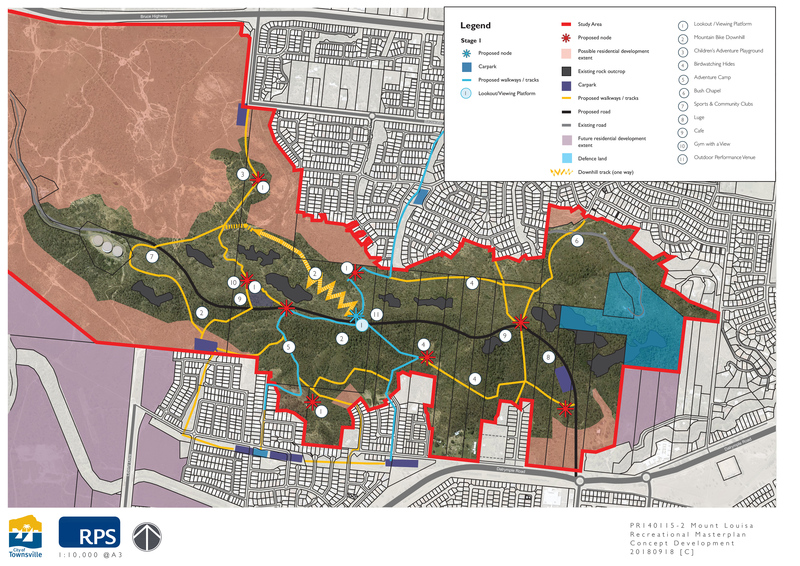 The Mount Louisa Open Space Masterplan has recently been completed. The Masterplan sets a strategic vision for Mount Louisa to be transformed into a world-class open space network providing adventure tourism experiences that can be undertaken by private entities, public sector or through joint development partnerships. The Masterplan includes a construction plan for 2019 which will kick-start the project by unlocking the Mount Louisa ridgeline for community use. The initial construction plan will focus on formalising the first of many walking tracks up to the ridgeline and ensuring access from Bayswater Road in the north through to Greenview and Altira estates in the south. Detailed design of the initial works including walking tracks, shelters and potential mountain biking downhill trail will commence in 2019. The longer-term plan for Mount Louisa outlines a range of medium-term and long-term opportunities for complementary recreational and commercial activities suitable for the area based on the slope of the land, access to infrastructure and connectivity with existing surrounding residential areas. The Masterplan is now open for the community to provide their feedback about the types of activities suggested, where these would be best located, and give their thoughts about any aspects of development that should be included as the project progresses. Council will use the feedback from the engagement period to help inform the priorities for delivery of the following phases of the Mount Louisa Open Space Network. The engagement period will be open from Friday 15 March 2019 until 10 May 2019. Members of the community are encouraged to submit feedback on the Concept Design Report.